After arriving back in Sacramento from a trip across the US I was asked to appear at Camp Park, in Dublin, California to entertain the troops and their families at a troop feed for Christmas. This time some family members with me, Jason, Windy, Markus and Judy. Erich and Jong could not make it. We arrived and I had to dress in the parking lot. The first building we went to was the wrong building. I felt so sad because children had seen me and now I was leaving without saying hello. We found the right building. There were over 200 soldiers and their families there. Some were going to Afghanistan the next week and some had just returned. They had a chair all set up for me next to the Christmas tree. There were 2 huge tables with gifts piled high on them. The packages were sorted by color, red for girls, green for boys. Markus was my elf and was helping hand the gifts out to the children. There were also huge stockings filled with toys for each child. After all the children had received gifts there were still loads left over. The organizers called to the party that was going on next door and told them to send their children over. So, we repeated the process and there were still gifts left. These were going to go to Toys for Tots. After all the photos were taken by the battalion photographer, a Lt Colonel who was the base commander and the battalion Sergeant major came over to me and asked if I would do one more thing for them. I said sure, not knowing what the request was. They wanted me to get into a HumV and pose with a 50 cal machine gun. I crawled into the unit and up thru the gunners hole. My grandson was also allowed to get on the unit. My toy bag was laid up on the roof too. We were the subjects of lots of photos. Afterwards, I was given the battalion coin by the Sgt major. I felt, being a vet, that that was a great honor. To all my fellow LEO’s who wear the red suit God bless you. 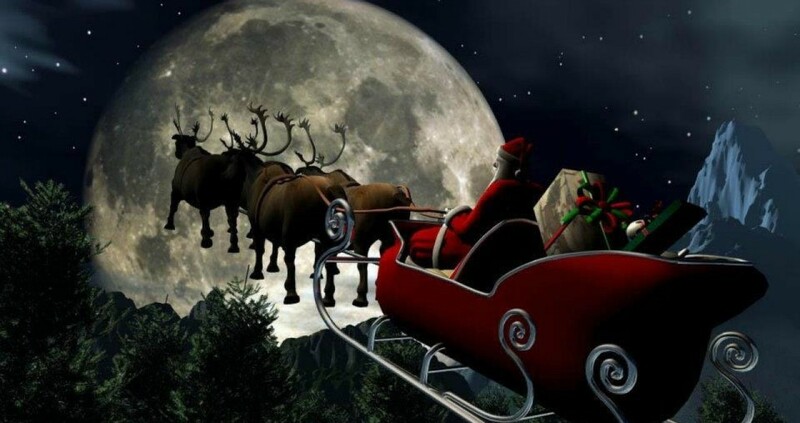 We KNOW what we have seen and what motivates us to be Santa. It’s that one special moment when the child that we have seen abused, breaks out into a smile at the sight of Santa that makes our day. 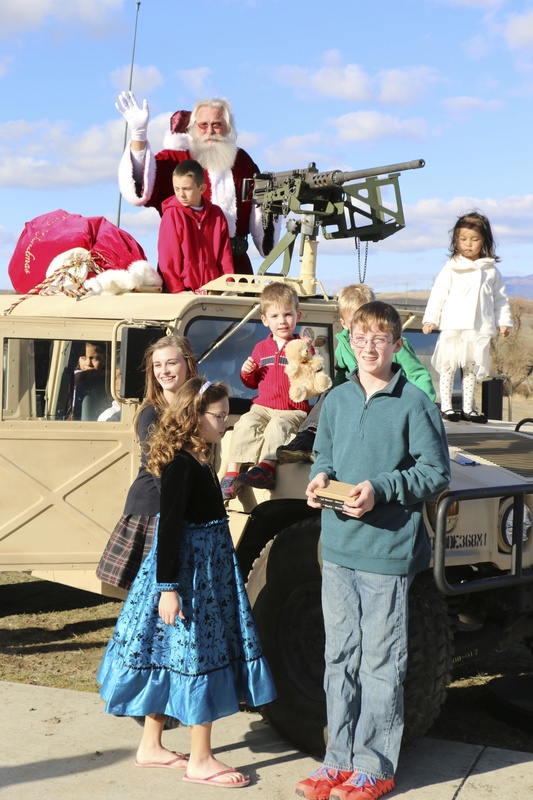 God bless the Santa community. October, 2011 we were in the Florida Keys, it was evening and 5 of us guys were piled into a car and headed in to Key West. A friend, John was driving and I was in the front passengers seat. We noticed blue police car lights in our rear view. John pulled over and came to a stop with the police unit behind us. I was looking in the outside mirror and saw the officer coming up on our passenger’s side. I rolled the window down before he got there. He looked in and said” Holy Crap, Santa Claus”. He explained that John had run a stop sign and that was the reason for the stop. John and I both said we were retired LEOs and had not seen the sign. He said ”No problem, just take it easy, and Santa, I want a skateboard for Christmas”. This was the talk of the rally for the rest of our time there. November of the same year we had stopped in Aransas Pass to see our friends the Hopmans. We were at a cocktail hour, enjoying the day. Jerry told me he had a neighbor coming over who loved Santa and would probably freak out when she saw me. About 10 minutes later the lady showed up. She was in her mid 50’s. She took one look at me and started yelling “Santa, Santa”. She came over and gave me a big hug. Later after she had gone Jerry told me her story. She had just lost her son to cancer and 2 years prior she had lost her daughter and grandchildren. They had been brutally murdered by a live in boyfriend who was now on death row. I told Jerry we would do something special for her the next afternoon. We were all gathered the next afternoon waiting for her. I had pulled my costume out from under the bed and was dressed as Santa, full monty. She came around the corner and again started yelling, but this time there were tears of joy in her eyes. She called her husband to come over and take pictures. Jerry also took loads of them. I have been stopped so many times while out shopping and had picture requests, I NEVER say no. If it makes me late for whatever was happening, so be it. Why did I become Santa? I have been asked that question so many times. To answer it one needs to know who I am and what I have seen in my life. I am now 68 years old. I was a police officer for over 30 years. I started as an MP in the Army in 1967, joined the Mountain View, California police department in 1971 and then migrated to the California Department of Justice, Bureau of Narcotic Enforcement in 1979. During my police career I spent 25 years in narcotic enforcement. I worked undercover for 12 years. During those 30 plus years as a police officer I saw so many things done to children by their parents and relatives that it truly saddened me to think that we as humans could treat our children this way. I will not describe what I saw because I want to keep this a positive piece. 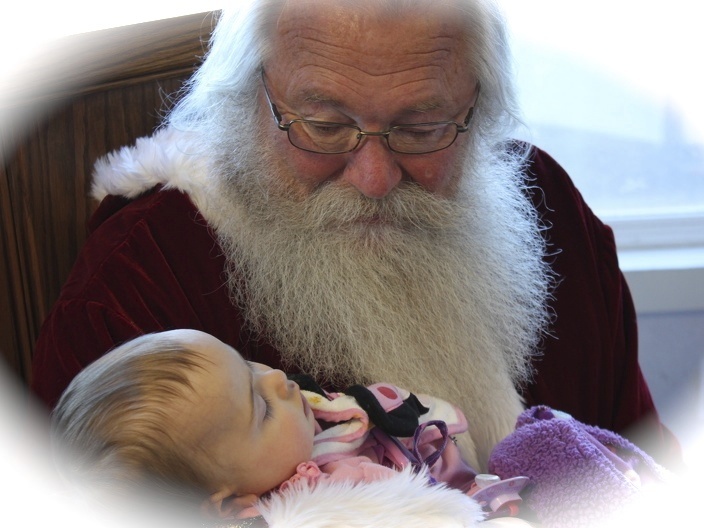 Suffice it to say that I decided to become Santa based mostly on what I had seen, with the thought that if I could make one child smile and see a gleam in his/her eyes for only a moment then I had influenced and helped that child for the rest of his/her life. So sit back, laugh, cry and most of all enjoy your trip through Santa Land. I first became Santa at the request of a co-workers son. Scott had asked me if I would be Santa for his son’s school class. There were a lot of special needs children in the class. I love special needs children. They are so innocent and so positive in their outlook on life, so how could I refuse. That was almost 15 years ago. Scott supplied me with a suit, beard, etc. My darling wife helped me get into the suit as it was rather small. The beard was a pain to keep on. I also had the help of my grandson Markus as my elf to help hand out candy canes to the children. Looking back I can only imagine what the children thought of this Santa. Yet they all enjoyed it immensely. Now we shift forward to Christmas, 2004, Tucson, Az. We were hosting a Christmas rally for our Holiday Rambler RV group. Our first night there we all went to the Golden Corral for dinner. I had on a red shirt, it had a faux belt and buckle appliquéd on it. I had just sat down to eat when Judy, my, wife, says, “Don’t look now but here they come” I turned to look and immediately had a small Mexican child on my knee. I asked him what his name was, how old he was and what he wanted for Christmas, all in Spanish. He looked at me and then yelled to his mom, “Mom, Santa speaks Spanish” in perfect English. This of course made me laugh. Never make assumptions based on ethnicity was just a lesson learned. I had 15 children in my lap that evening. The manager of the restaurant came over and spoke to me. He said “ I saw what you did I looked at him and asked his name, where he lived and what he wanted here, I am so sorry that the children bothered you and would like to refund the price of your meal” I told him “Children are NEVER a bother for me”. We were camp hosting at a Christian Retreat in Dandridge, Tennessee, near Sevierville and Pigeon Forge. The owner of the ranch and his family had taken us to the Cracker Barrel in Pigeon Forge for dinner. His youngest son worked there. 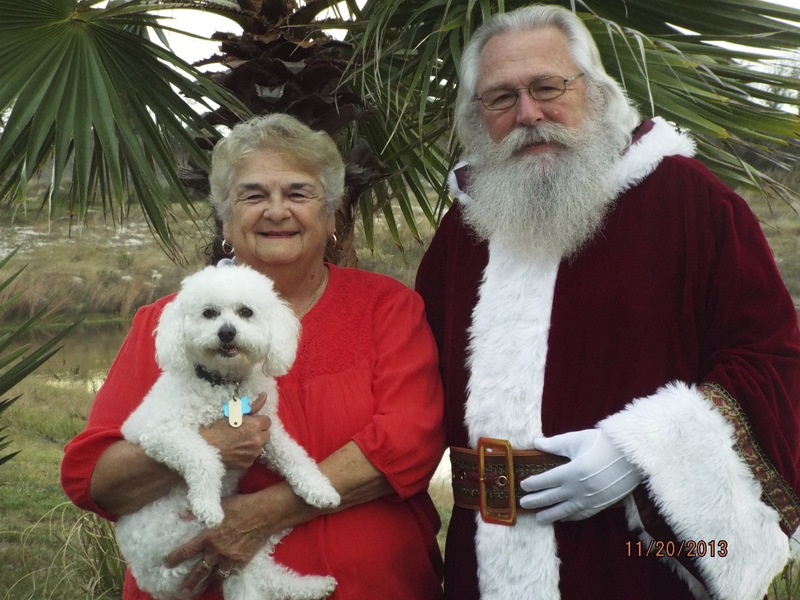 By this time I was in to full-blown Santa mode, longer white hair, long white beard, and a red shirt. We had been seated and were in the process of ordering our meal when a woman of maybe 50 came over to our table. She excused herself and then asked if I would mind writing a message to her grandson who was at the age of “not believing”. I told her sure and asked for paper and a pen as I had none. She said all she had was a $20 bill. So the message got written on a $20 bill that she said she was giving him for Christmas. She thanked me profusely and left.